1.It is a good helper to sort travel clothes, let you don't worry about your clothes are too many to fit into luggage. 2.Perfect for organizing and storaging unoaganized items such as off season clothing, shoes, cosmetics, etc. 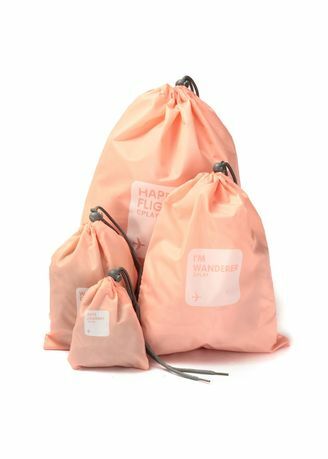 3.4 different size bags with single drawstring closure to storage different items. 4.Protect suits from dirt, dust, damp and bacteria, keep your luggage tidy and clean. 5.Perfect for travel, business trip, camping, bedroom and so on. 6.It's waterproof, reusable, easy to clean and carry.